In the fall and winter months, your energy bill can seem like a vampire or zombie that keeps coming back worse than before. This season you will not need garlic or a silver bullet to keep these bloodsuckers away, but learn how to be smart about setting up and using your devices to stay energy efficient! Your best investment will be in insulation. Hundreds of thousands of dollars in energy costs are lost each year due to escaping heat and cold air in homes without proper insulation. BreedLove can help you insulate your home and prepare you for this upcoming season. Also, replacing your furnace filter once a month or as needed is crucial to efficiently heat your home. Find out what maintenance is required to keep your heating system operating efficiently by scheduling service with BreedLove. Everyone’s first instinct when they walk into a cold room is to crank up the thermostat for what they think is a “fast” solution. 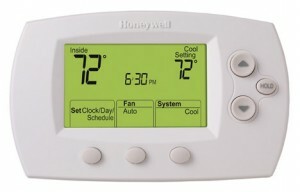 Constant changing of a thermostat actually makes your heating system over work itself which wastes energy and money. When you are home and awake, set your thermostat as low as you can while staying comfortable.When you are asleep or out of the house, turn your thermostat back 10° to 15° for eight hours and save around 10% a year on your heating and cooling bills. A programmable thermostat can make it easy to set back your temperature. During the day, take advantage of heat from the sun by opening curtains on the south-facing side of your home. This will allow sunlight to naturally heat your home while the sun is shining its brightest. Remember to close the curtains at night to reduce the chill you may feel from cold windows. Speaking of cold, drafty windows; cover them! Add caulk or weatherstripping to seal air leaks around leaky doors and use clear plastic film on the inside of your window frames. Once the plastic is in place, use a blow-dryer, holding it an inch from the plastic, and run it around the edges of the windows to ensure the seal is tight as possible. A tight seal will help to reduce infiltration. Finally, for a fun and cost effective decorating tip, use LED lights this holiday season. LED holiday lights use at least 75 percent less energy and last 25 times longer than incandescent lighting. In addition to consuming less energy, LED lights don’t emit as much heat and are more resistant to breakage, making them a safer alternative. Bonus tip: Always unplug your holiday lights before going to bed or leaving the house. This will help in reducing utility bills and saving energy! With the fall and winter holiday season upon us, don’t be stuck in the cold! Learn great ways to heat your home while being energy efficient, cost effective, and get rid of your energy zombies.